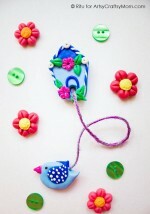 These Cute Clay Penguin Craft wire holders work great for your notes, business cards or photos. 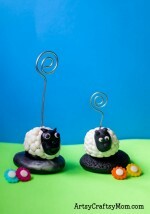 These are made with homemade cold porcelain clay that costs a fraction of what you would spend on polymer clay. They also make great gifts! We will be doing a series of clay projects in the coming weeks and I hope you are as excited about this as I am. I will be sharing projects from easy to difficult, each time exploring a slightly more complex idea. First, my secret cold porcelain recipe that I make at home. 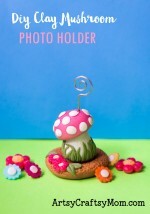 Gone are the days when you need to shell out thousands of rupees on polymer clay. 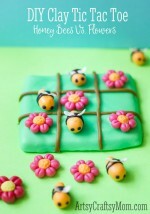 This recipe is easy, robust and costs a fraction of polymer clay. Mix all the ingredients in a microwaveable bowl. Microwave at medium power for 30 seconds. Stir it nicely. Microwave again for 30 seconds. Stir it thoroughly. Microwave once again for 30 seconds. The clay will be in a lump form by now. Scrap out the clay on a smooth surface. Apply some petroleum jelly on your palms. Knead the lumpy clay till it cools to room temperature. and all the air pockets & lumps disappear. Your clay is ready. Wrap in cling film and store it in an airtight container. This clay needs to be kept away from water & can be stored for short durations. Exposed to air it hardens completely within a week’s time. The above recipe makes white clay, but once the PVA glue dries, it becomes translucent. To retain the whiteness, take a small lump of the clay , add 3 drops of white acrylic paint and knead till a smooth opaque shiny clay is in your hands. Roll the white clay into a sphere. Set aside on a smooth surface. This will form our penguin’s body. Take a smaller piece of the white clay and add a dab of blue paint. Knead well till the color is mixed uniformly. The blue would look light but remember all colors turn one shade brighter once they dry. Roll into 2 tiny balls and using your thumb make wings as shown in the collage below. Add the wings to the sides of our penguin body. When the clay is wet, the two pieces will stick to each other easily. If they don’t , use PVA glue. To make the crown, roll the blue clay into a snake shape and place on the top of penguins head. Pinch at the top. Using a clay modeling tool or a toothpick make grooves as shown. Mix a small piece of white clay with brown paint and roll into 3 tiny balls. Press 2 to make the legs and turn the third into a conical shape that will now be its beak. Make tinier balls using black color and clay rolled together. It looks grey at the beginning but dries black. The final (optional) step is to add a wire holder through its head and body. take a long strip of wire and with the help of pliers twist it into a coil. Leave undisturbed for atleast 3 days in a cool dry place, away from humidity & direct sunlight. Voila! 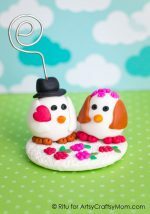 the cutest ever clay penguins are ready. Use them on your desk to hold stick it pads, little notes , a small photograph or even to display your visiting card. These little penguins also make perfect handmade gifts for friends, teachers, and family. 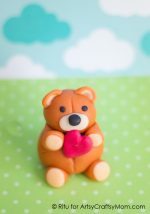 For Valentine’s day, add a clay heart. If you don’t want the wire mesh, use the penguin as paperweights too.